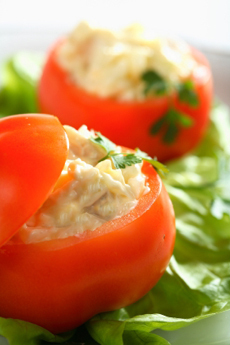 Stuffed tomato with egg salad. Photo by Pawel Strykowski | IST. KAREN HOCHMAN is Editorial Director of THE NIBBLE. This is Page 2 of a three-page article. Click on the black links below to visit other pages. Alas, the person who first mixed mayonnaise with hard-cooked eggs is lost to history. But he or she was most likely French, given the history of mayonnaise. As eggs were ubiquitous and inexpensive, no doubt someone got the recipe down and served it as a salad. Because we know that the sandwich was formally invented in 1762; shortly after the invention of the first mayonnaise sauce, in 1756 (see the history of the sandwich). And someone may well have slathered it over sliced eggs. Cream and egg sauces were popular. But mayonnaise as we know it today was re-conceived by the great chef Marie-Antoine Carême in the early 1800s. So let’s guess that sometime after the codification of mayonnaise in the early 1800s, egg salad was created; and that some Brit (a good guess, as sandwiches were not as popular on the Continent) created the egg salad sandwich. Egg salad became part of an array of luncheon and sandwich salads that combine a high-protein food mixed with vegetables, spices and herbs, bound with an oil-based dressing—vinaigrette, mayonnaise or a variation. Sometimes, the chopped eggs were mixed with melted butter. Egg salad is the most affordable of the protein and mayo salads that include chicken and turkey salads, ham salad, tuna and salmon salads and seafood salads (crab, lobster, shrimp). Carbohydrate-based salads developed at the same time, but were always “sides” to the protein-based salad. Thus, one could have a side of pasta salad or potato salad with one’s tuna salad. In fact, by the early 20th century, luncheon dishes often presented a scoop of the “protein” salad on a bed of lettuce, accompanied by a scoop of potato salad and macaroni salad or cole slaw. We’ve seen that what went well on a plate with lettuce leaves and tomato slices also went onto a sandwich with them. Egg salad, tuna salad and chicken salad remain among our most popular sandwiches, although ham salad seems to have all but disappeared except in fancy tea sandwiches. The carbohydrate salads—potato salad and macaroni salad—never ended up in sandwiches. Even 100+ years ago people understood that you had to eat your protein—meat, fish, eggs—before the carbs.